I’m mostly off-line this week with spring break, but I’m just popping in here to talk about this week’s podcast. It’s really a good one, so I hope you’ll give it a listen! There comes a time in many people’s careers when you think “hmm…is this really what I want to be doing?” One option is to switch jobs, or even careers. But another option — and sometimes the wiser option — is to turn the job you have into a job you love. Almost any work situation can be improved a great deal by some strategic thinking, creativity, and being open to opportunity. So this week, Sarah and I are talking about career crafting. We have both done a fair amount of this, though I think hers is the more interesting version of it. A few years ago, when she was seeing patients for 9 clinical sessions per week, without a particular focus within her specialty, she was feeling like she was on a treadmill. She was never getting enough time for her various other interests — both medical and otherwise. So she figured out what she wanted her ideal week to look like, and started making some adjustments. One thing she did was to volunteer to become the associate director of the new residency program her employer was starting. This allowed her to tap different parts of her expertise (in teaching and planning) and to pursue her interests in reforming graduate medical education. She also doubled down on pursuing a specialty. She had inherited a number of transgender medicine patients from a physician who’d been in her practice previously, and so she became well-versed in best practices and the (rapidly evolving) guidelines. Since this is such a new and changing field, she could become a sought-after expert a mere 5 years into her life as a practicing physician. This is opening up all sorts of opportunities for research and thought leadership too. And finally, she made space for sidelines outside her main job. About a year and a half ago, she asked for an 80 percent schedule. On the one day per week she doesn’t work at her main job, we record our podcast, she often blogs, and she’s been working on her planning e-book. There are not many people in the world with recognized expertise in transgender medicine AND planning processes, but that’s a happy upside of carefully crafting a career into something that works uniquely for you. In my case, I am quite happy with how I have — over time — been able to incorporate a lot of my different interests into what I do now. 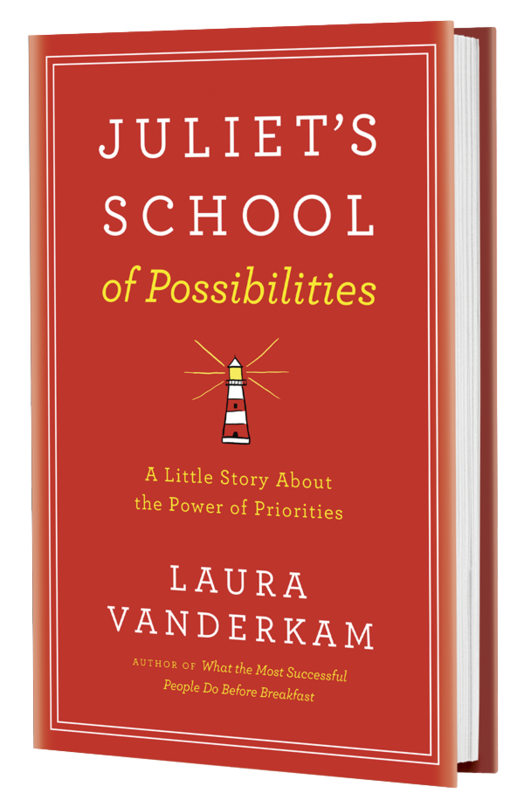 I’ve always loved to write (and write long) and I’m doing that now with my books (even fiction, now that Juliet’s School of Possibilities will be out in March 2019!). Growing up, I loved singing, dancing, and performing, and now I’m on stage pretty much every week, doing my own one-woman show (with an emphasis on time management). I like math, and economics, and original research, and my time diary projects have allowed for all that. There is no one obvious job one can apply for that incorporates all this, but when you make your own job, why not? If you’ve been able to turn the job you have into something closer to your ideal situation, I’d love to hear about the process. How did you start crafting your career to spend more time on what you like, and less on what you don’t? In other news: Off the Clock, my next book, will be out on May 29! I am happy to announce my Off the Clock book club. If you pre-order a copy (before May 29) you’ll get a few goodies: an advance excerpt (so you can start reading now! ), access to an exclusive webinar about the book, an Off the Clock Time Makeover Guide, and I’m happy to send you a signed book plate that you can stick in the physical book when it comes (US + Canada only). Just fill in the details about your purchase here. Thanks! Pre-orders show booksellers that there is a lot of interest in the book, and influences how many copies they wind up ordering. I don’t enjoy being an attorney, so I’ve been working towards a goal of early semi-retirement. That is definitely still the plan. However, I found a new position a few months ago that has really helped me hate work less. I still can’t believe that I found a work-from-home attorney job! Instead of commuting to an office to sit at a desk and review papers, I can sit by the fire at home and do the same work in my slippers. I even get to take breaks to snuggle with the twins. It’s still a job, but much more tolerable for the next few years. @Harmony – It’s funny how the same work, done at home, can be so much more tolerable than when done in an office! Thank you for introducing me to the concept of career crafting. I look forward to applying it to my own work. Great show! I was so glad that Laura mentioned Cal Newport’s book “So Good They Can’t Ignore You” because that’s been a guiding principle for me. I now work from home, 30 hours a week, for a tech company that I love, after moving 800 miles away. As a contract employee I don’t have to deal with a lot of the “political” and performance review related stuff (though admittedly, it’s a lot easier for them to get rid of me and I don’t get benefits). But I love this schedule, and working from home. My life feels more like the job is just one part of it, not the all-encompassing thing everything else must fit around. I’ve traded off advancement, for sure. I’ll never be a Director or a VP on this path, but I get to keep doing autonomous work I love, from home, while living in a place that works better for us. And financially, this is better for us, both because we moved to a lower COL area, and my hourly rate is higher. A mentor of mine once told me that every job is a continual push to do more of what you want, and less of what you do t. Thanks for providing such a concrete example! Sarah gives me hope that I will eventually find my way to a job that works for me! Love this episode! I have a job that I really do enjoy but it is not what I really want to do. I am entering that stage of life where my kids are beginning to leave home and it seems to be the perfect time to begin to craft my work life to something I really WANT to do. Thanks for the great insights! I enjoyed this episode. Like Sarah, I am a clinician (occupational therapist) who wanted to do more teaching. Over the period of a couple of years, I was able to get some adjunct teaching work, and eventually transition to a full- time teaching position as a professor of occupational therapy. Being a professor really lends itself to crafting a career. There are endless opportunities to explore research, specialty areas, leadership, etc. My problem is that I love so many different things, I have to be careful not to overextend myself! This was a great episode. One thing i’ve started doing is when I find a job posting of a position I’d like in future, I pull out the parts that interest me and then find ways to work them into my current job. Sometimes it works and sometimes it doesn’t, but when it does it makes my job more enjoyable and gives me skills to make me more marketable in the future. @Amanda P – what a practical and wonderful idea! Yes, if something draws your eye in a job listing, why not see what you could incorporate into your current life? I’m just getting started on the podcasts (I bought a speaker to play my iphone in my old car just for this!) and was working my way from the beginning forward but then realized that I wanted to comment too so I’m mixing it up. I’m curious about Sara’s story about crafting her career and the changes that have occurred over the last few years. It makes a nice story looking back but I’m curious how it felt while she was in the midst of it. I’ve followed her blog for a while so heard a bunch of it but curious. As most people, I want it all now! @Arden – I’m flattered that you got a speaker in part to listen to our podcasts 🙂 I think life in general only makes sense in retrospect. It’s really hard to plan these things looking forward. However, you can constantly be monitoring what makes you happy and what does not, and you can figure out how to do more of the happy stuff and less of the clock-watching stuff. You can also be on the lookout for opportunities that sound fun, and see what they lead to.